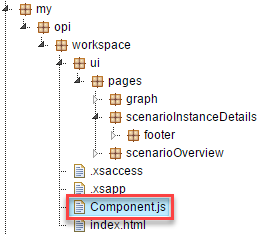 Warning: This page contains code snippets and require the reader to have good understanding about the model-view-controller (MVC) architecture in SAPUI5. 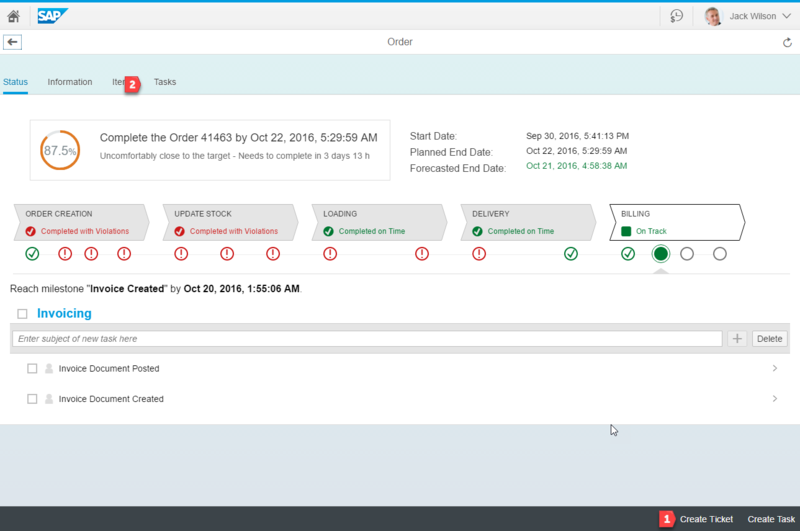 This is part of the blog series which details about the possible UI extensions in SAP Operational Process Intelligence. 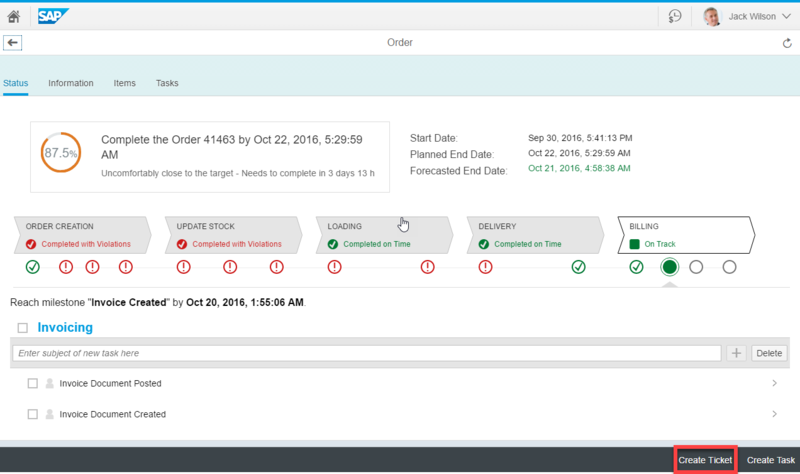 The below image is the scenario instance details page, where you are presented with all the information of particular scenario instance (for example, Order No 41463) like the phases, milestones & overall status. With SAP OPInt SP12 and above, you can create custom navigation actions which appear in the scenario instance details’ footer with situational awareness (enabled based on business conditions) and even add deeper process insights as new tabs using associations. Custom actions in the footer to perform actions which are not possible using ‘navigation actions’ with situation awareness – you want to add a custom action to create an internal ticket if a particular order is overdue or you want to release a blocked sales order on click of a button or you want to remove that particular order from SAP OPInt, so on and so forth. Add additional tabs which shows rich information like geo maps. 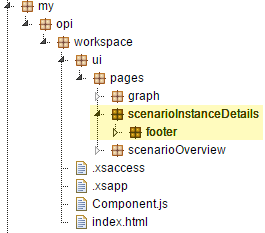 Complete the pre-requisite before you proceed with the extension of scenario instance details page. You already have the services required to perform the action you want to trigger (in this example, to create an internal ticket) using the custom action. Step 1: Create a new package under my.opi.workspace and name it as ui (if not available already). Create sub-packages pages, scenarioInstanceDetails & footer as shown below. This is where we will place all the source code to extend the scenarioInstanceDetails page. 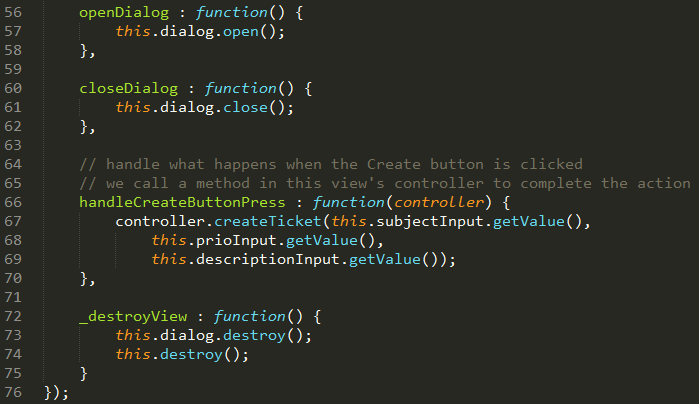 In the fragment.js, add the following piece of code to create the UI element (sap.m.Button) and set its properties. Under the footer package, create two new files and name them NewTicketDialog.controller.js and NewTicketDialog.view.js. Note that this is view which is called as a dialog in the controller implementation above. 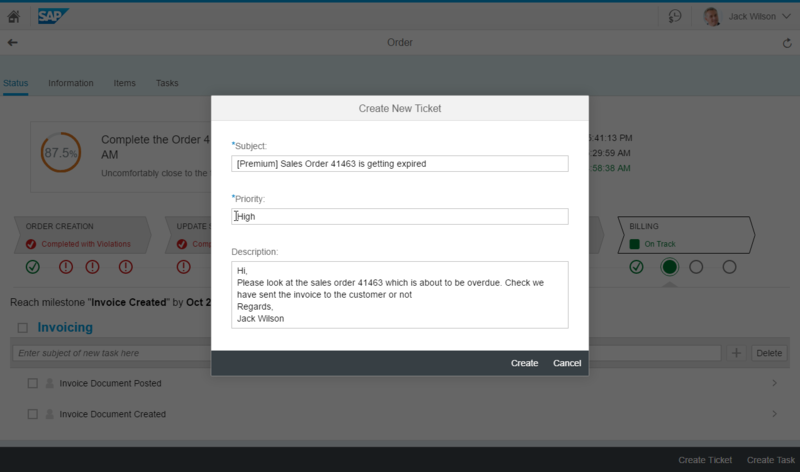 In the createContent method, you create the UI elements which you want in your dialog – Ticket Subject, Priority & Detail Text, along with the buttons to complete creating the ticket or cancel the action. Apart from the createContent method, you would also want to implement the following methods: getControllerName, openDialog, closeDialog, _destroyView & the handleCreateButtonPress. In the createTicket method, we call the service to create the ticket and pass the subject, priority & description as JSON (as per the service definition). Now that we have created the artefacts required for the extension, finally we need to register this UI extension in the Component.js file. Open the Component.js file from the package my.opi.workspace. If you do not see this, then please revisit with the pre-requisite section. 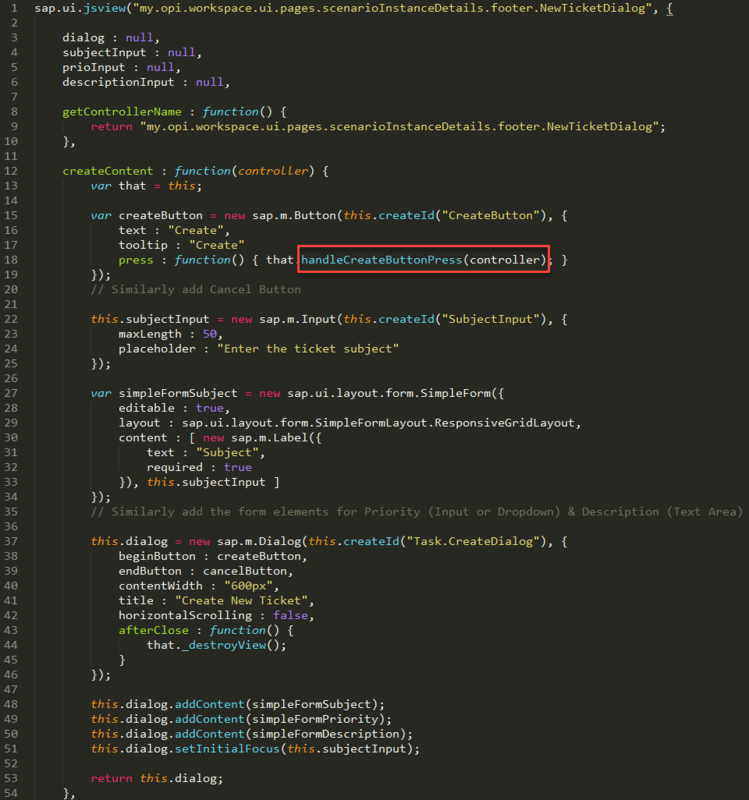 In the Component.js, add the controller and view extensions under the metadata customizing section as shown below. Note that if you already have a controller or view extensions (as explained in the other blog) then add the footer extensions to it. Step 6: Activate all the artefacts and access your new custom OPInt workspace. (http(s)://host:port/my/opi/workspace). When you navigate to the scenario instance details page, you should be able to see the ‘Create Ticket’ button in the scenario instance details page’s footer. 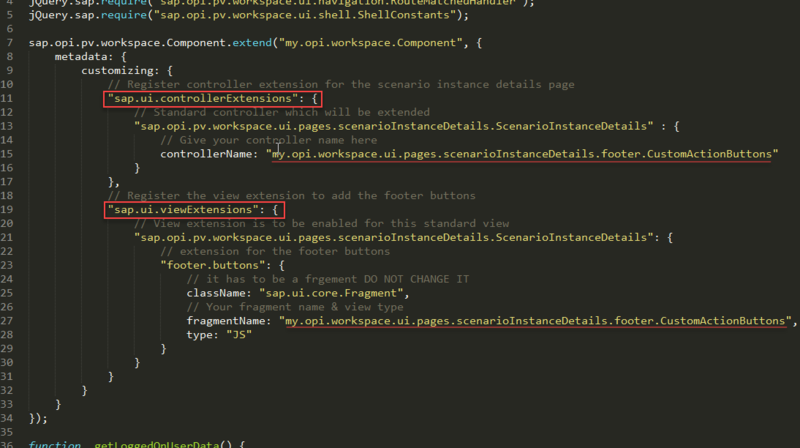 If that is case, then visit the next blog in the series to know how you can control when to enable the custom actions. This looks useful, and hope to try some of these UI extensions in the future. One question that comes up from users is – how to setup filters in Space.me. For example a user would like to filter a scenario to show their region, or group. They have to do this every time they login, as OPI does not remember anything. A way to set some default behaviour, per user, would be very useful as a UI extension – i.e. Filters at scenario level, or Measure/indicator level, and setting Sort order in any list of Instances. Thanks for the feedback. While we get to the drawing board on how to get the personalisation in SAP Operational Process Intelligence, you can recommend the users to apply filters and bookmark the URL in their browsers. When they want to apply that filter and view the dashboard again, they can use the browser bookmark to apply the exact same filter. This deep linking URLs works across OPInt and not just for filters. For example, navigate to a particular KPI after applying time filters or navigate to a particular instance which is og high importance, etc. Thanks Sesh – that is a good tip, to use the deep linking. At least the users can start with the right view/filter and then change as needed. 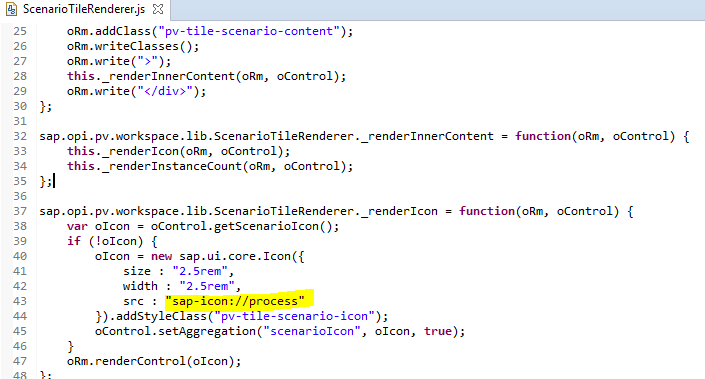 I have to develop custom UI part on scenario tile, I want to place logo instead of sap standard icon “process” on scenario tile. I have my own logo to be placed on scenario Tile. I got the file where process icon has been set up in code. I need to override this file in custom work space and i have added in Component.js file under customizing part. I have implemented this,logo has not changed on OPInt dashboard. Any other changes to be done .Suggest me on this. I am afraid to say that the customizations that you are trying to do for ScenarioTile are not possible. Space.me supports customization of views and controllers only. ScenarioTile is a custom UI5 control developed by us and it is not a view. So, it is not possible to have any customizations to ScenarioTile.